It was such a sight to behold as the National Youth Organizer of the National Democratic Congress (NDC), George Opare Addo led several young “Akatamansonians” from every corner of Ayawaso West Wuguon to march through the constituency. 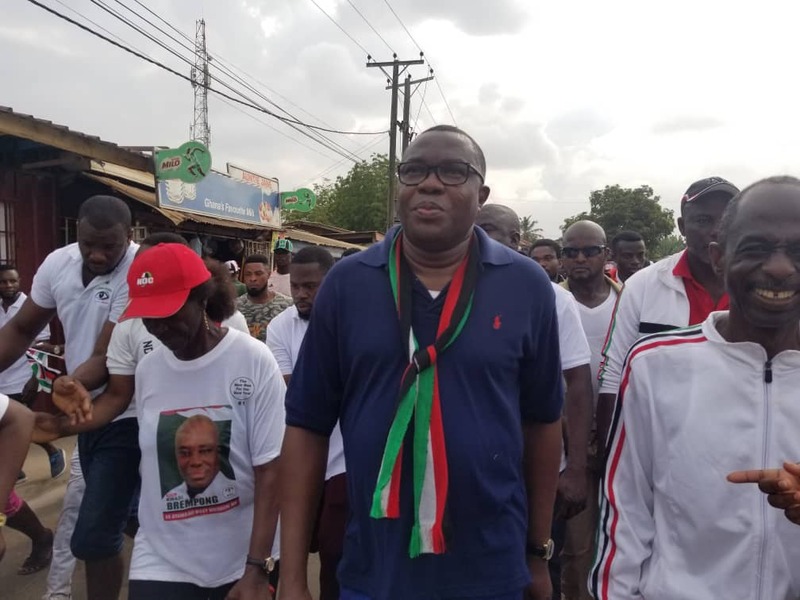 The march which attracted party executives and members was dubbed ‘Walk 4 Victory’, a project by the National Youth Wing to win the vacant Ayawaso West parliamentary seat for the NDC. Speaking to party supporters gathered at the La Bawaleshie JHS school park, Mr Opare Addo popularly known us Pablo said, the NDC is the only party committed to developing the constituency and called for an end to 22 years of NPP’s grip on that seat. “This by-election is an opportunity for us to take back the Ayawaso West seat from the inept and incompetent NPP. For 22 years, they have done virtually nothing to develop the constituency. Most of the infrastructural developments you see are initiatives of past NDC governments. The NPP only uses this constituency as it’s cash-cow for votes”, he said. Crowds of jubilant constituents and some party faithfuls made their way through some principal streets in the constituency. The procession set off from the La Bawaleshie JHS Park, went through the Ouagadougou Avenue; Lagos Avenue down to the Boundary Road. The March then went through the Mempeasem township, passed through the chief’s palace, Trinity Road, the Legon Hospital Road through to the Staff Village. The march entered it’s final stretch when it went through the main Legon road and joined the Bawaleshie road, back to the La Bawaleshie JHS school park, where it all started. In his speech to his teeming supporters, candidate of the National Democratic Congress (NDC) Delali Kwasi Brempong expressed his gratitude to the people for showing up in their numbers and for their show of love. He pledged his commitment to foster development in the constituency when he is elected Member of Parliament. The well-patronized event also received speeches from National party executives who assured the people of Ayawaso West, the NDC’s commitment to create more jobs and foster socio economic development for all Ghanaians. The Walk for Victory programme was organized by the National Youth Wing of the NDC under the leadership of George Opare Addo, National Youth Organizer. The event was geared towards mobilizing young people in the constituency and party to campaign massively for the victory of the NDC in the soon to be held by election. The Ayawso West Wuogon seat became vacant after the sitting MP, Emmanuel Kyeremanteng Agyarko kicked the bucket after a protracted illness. The Electoral Commission of Ghana declared the seat vacant and scheduled a by-election for January 31st in accordance with the law.